Complete the form below and then click "Download Trial" to download the trial version. Complete the form below and we'll get back to you about a quote. 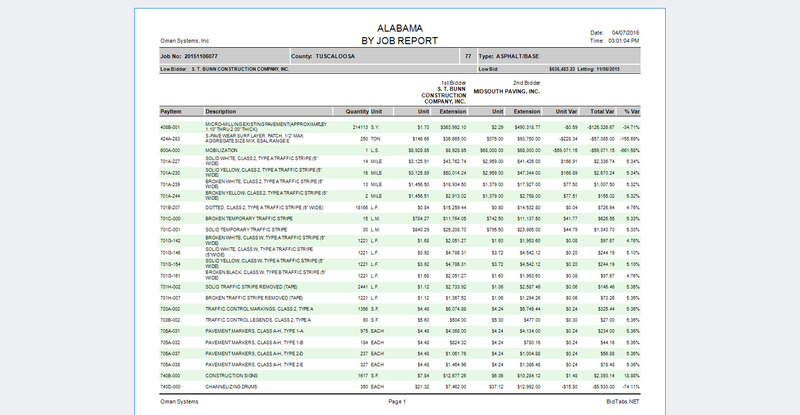 bidTABS Professional is a real time saver. I especially like it for tracking competitors historical prices which gives me an idea of what prices they’ll bid in the future. Great program. bidTABS Professional is a great product with great customer service. I am a huge fan! I especially like to use bidTABS Professional for researching new markets and monitoring market shares for specific types of work. 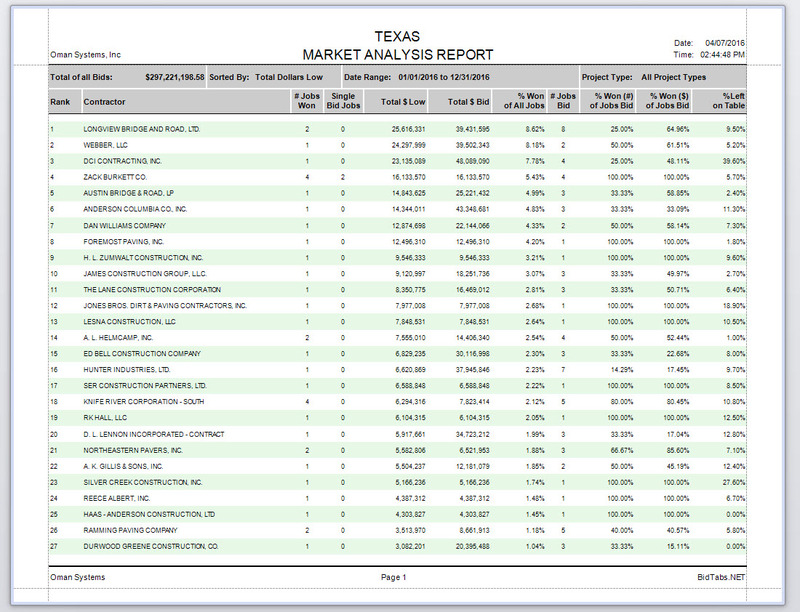 I like tracking our statewide and district wide market shares to see how our company is performing. 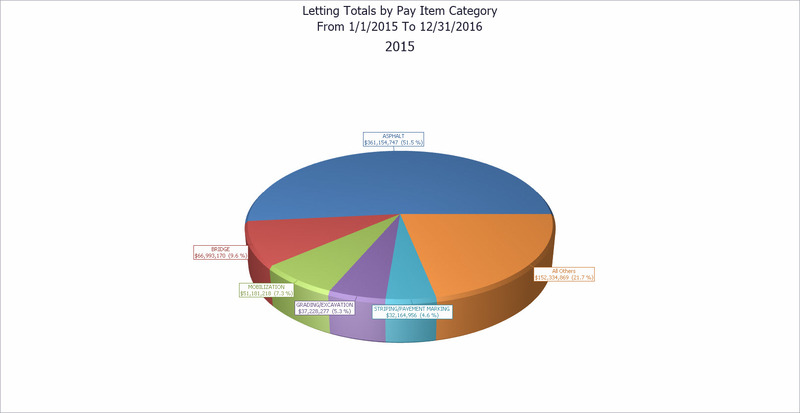 We use the Pay Item Report as a reality check for some pay items. We especially like that report for change orders. Once a year we run a market share report which saves us a ton of time. Customer service is top notch. Oman System’s bidTABS Pro has saved our design teams a tremendous amount of time developing cost estimates. 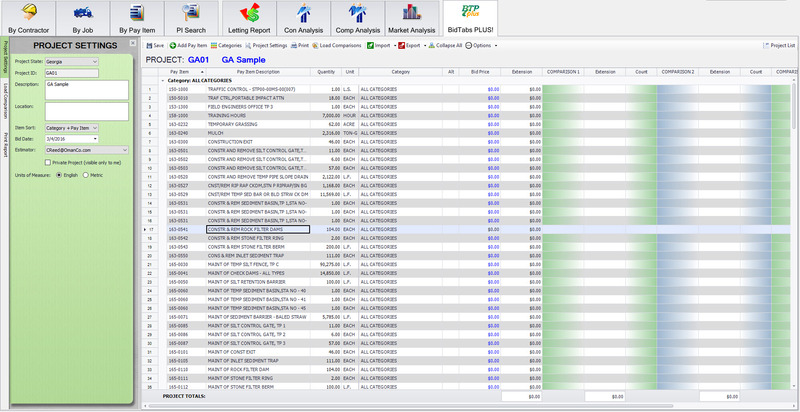 The ability to quickly search past DOT bid tabs and compare unit costs is key to the accuracy of any estimate. I use bidTABS Professional everyday and I recommend it all the time. bidTABS Professional played a major role in me winning the last job I bid on. I even use it for non-DOT jobs. I love using it! I would rate my satisfaction with Oman Systems products and technical support as 99.9 % – because nothing is 100 %. Oman Systems understands that each DOT has unique requirements for many of their systems. We have the knowledge and programming capabilities to work with your staff to customize the system to your specific needs. Contact us for a complete demo of bidTABS.NET Enterprise Edition. As the business climate becomes more and more competitive, information is critical to make better business decisions. Understanding your competition, the market and prices can be the difference between first and second. 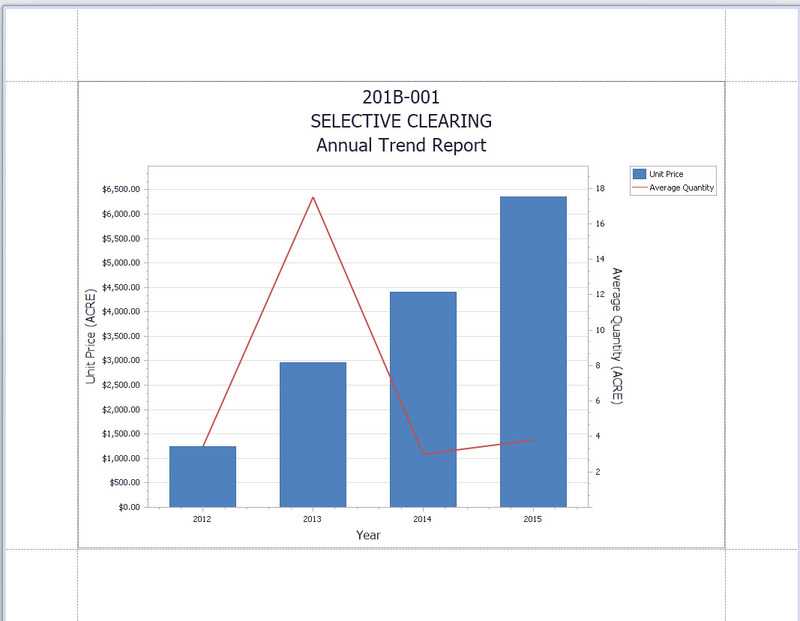 “I already have access to all the information I need from the DOT.” – It is true that the raw data is available for free from the DOT and there are systems available that provide some of the data. However, there is no other system that provides the type and depth of information you can find in bidTABS.NET. 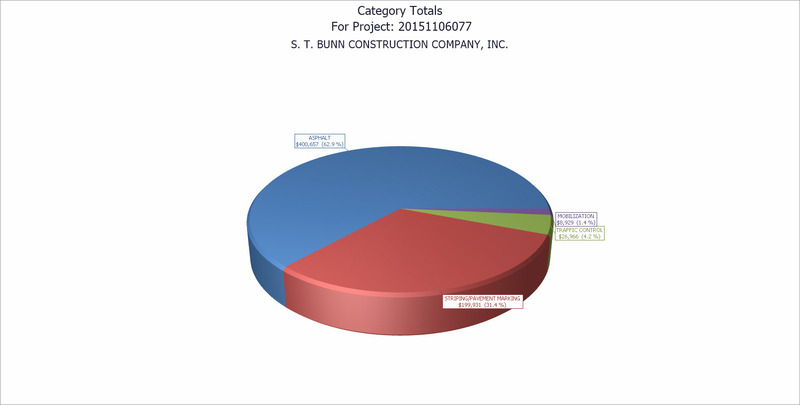 That is why more DOT’s, contractors, and associations use bidTABS.NET more than any other system (even to analyze their own data). “I don’t bid using tabs. Every job is unique.” – Using a tool like bidTABS.NET is not designed to replace your estimating system. It is designed to assist you in pricing those hard-to-find items as well as a back check of your prices. “I don’t care about my competition. My cost is my cost.” – Your competition cares about you. With margins getting tighter and more contractors bidding on projects, having access to the best information can be the difference between winning and losing a bid. “I already have a thorough understanding of my market and prices.” – Prices are always changing (and usually getting lower). New items are always being added. 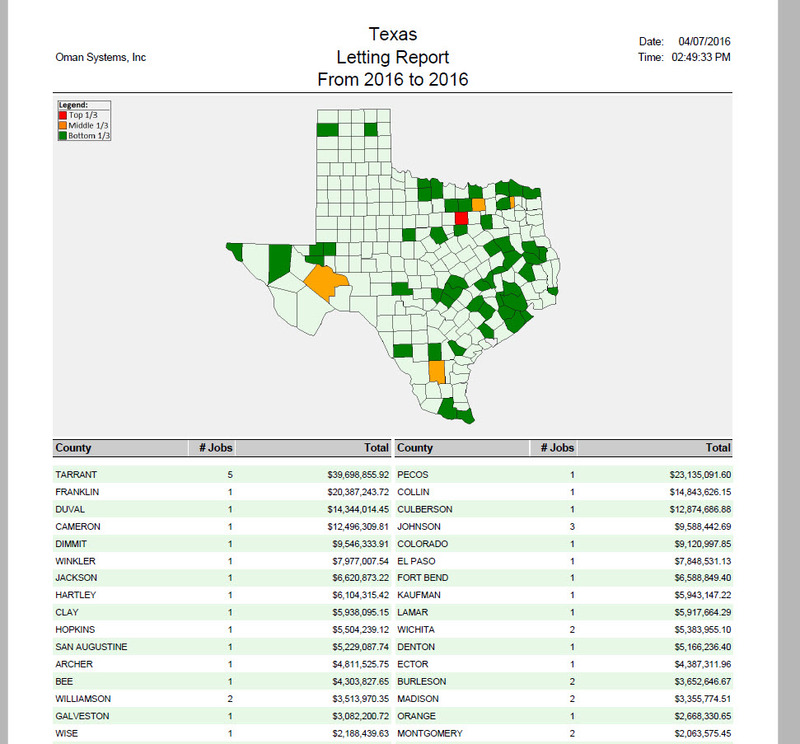 New contractors are showing up at each letting. bidTABS.NET helps you to stay ahead of all these changes. “I don’t bid on many DOT jobs.” – Whether you are bidding a lot or just a few DOT projects, bidTABS.NET is a low-cost solution that allows you stay on top of prices and your competition. 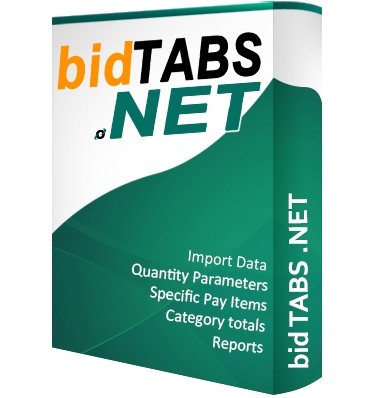 Using bidTABS.NET to successfully negotiate one change order could easily justify the cost. © 2019 Oman Systems Inc.